But after thinking it through, I’ve decided that it’s way too delicious not to share with you guys. Really, it would be cruel to keep something so good all to myself. Now, if it’s credentials you want, I have ’em. For starters, every time I bring this lasagna bolognese to a party or family gathering, the people go crazy. It’s always the first thing to be devoured. It’s so good that someone has literally tried to pay me $100 to make them their own batch. Plus, bits and pieces of this recipe were picked up through my travels in Italy, and then tweaked to perfection in my kitchen. 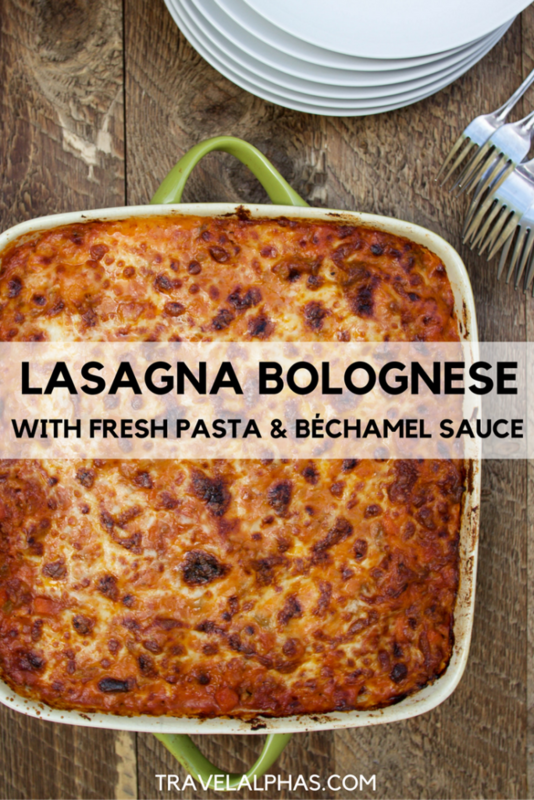 Essentially, the title “The Best-Ever Lasagna Bolognese” couldn’t be more accurate. Layered with freshly made pasta sheets, my famous bolognese sauce, a ricotta cheese and spinach mixture, topped with a cheesy béchamel sauce, and baked to golden-brown perfection, you are going to fall in love. 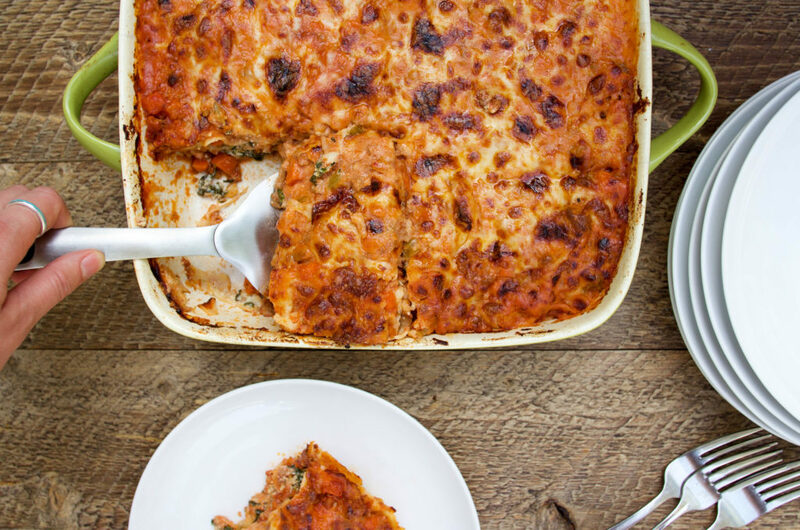 Guaranteed, you’ve never had better lasagna in your life. If you’re ready to try my life-changing, best-ever lasagna bolognese with fresh pasta, ricotta-spinach layers, and ooey gooey cheesy béchamel sauce, then let’s get started. In your decision to make this lasagna bolognese, you should know something. A lot of love, time, and effort is required. 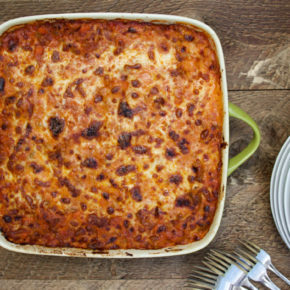 This isn’t your average lasagna, and it doesn’t come together with an average amount of work. Oh, no. We’re slow cooking this bolognese sauce so the flavors of the Chianti Classico, beef, pork, sweet carrots, aromatic black truffle, and San Marzano tomatoes can marry together into a rich, flavor-packed sauce. We’re also making pasta from scratch, with a recipe that I picked up during a cooking class in Florence, Italy. Then we’re layering everything together and baking it off in the oven until it’s brown, bubbly, and beautiful. If you have six hours to spare for the best lasagna bolognese ever, then you’re in for a treat. To make this lasagna, there are a couple of special ingredients and pieces of equipment you’ll need, which you may not already have. I’ll list them here now. If there’s one thing I know in this life, it’s that you’re going to love this lasagna bolognese recipe. Yes, it may take a little (okay, a lot) of time to make, but it couldn’t be more worth it. 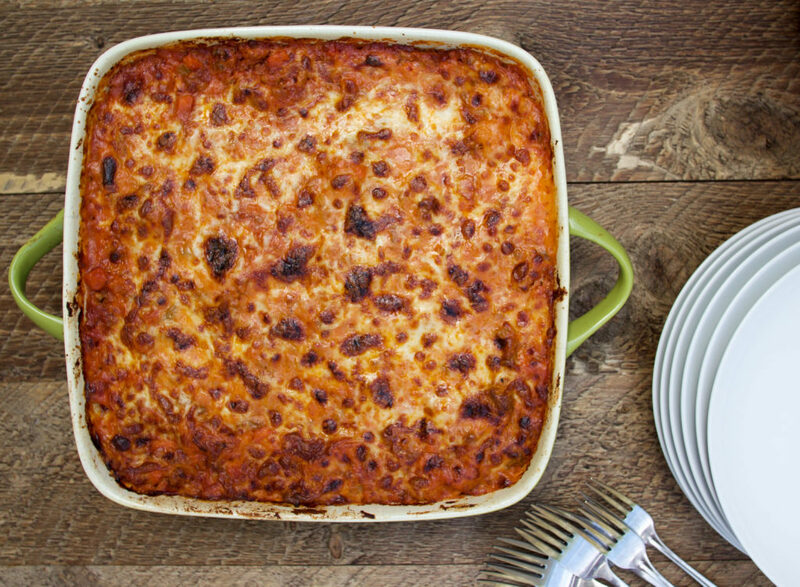 This lasagna bolognese is perfect for taking to parties, serving at family gatherings, prepping your meals for the week, and my favorite: eating it on the couch, in your pajamas, while watching a movie. 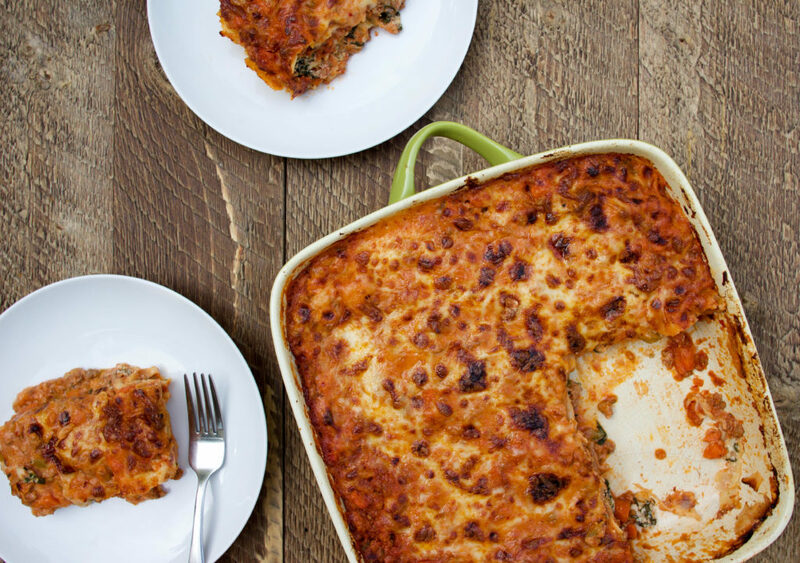 I hope you love this lasagna bolognese as much as I do! This lasagna is layered with freshly made pasta sheets, flavor-packed bolognese sauce, and a ricotta cheese and spinach mixture. Then it's topped with a cheesy béchamel sauce, and baked to golden-brown perfection. So good. Heat your Dutch oven on the stove over medium-high heat. Add in olive oil. Once oil is hot enough, add in carrots, onion, celery, whole smashed garlic cloves, salt, pepper, and red pepper flakes. Stir frequently until onions are translucent. Add in ground beef and ground pork. Season the meat with salt and pepper. Stir and break up the meat into small chunks. When the meat is lightly browned, add in tomato paste, continue stirring, and cook down tomato paste for two minutes. Next, stir in San Marzano tomatoes, beef broth, and cheese rind. Season more with salt, pepper, and red hot pepper flakes. Bring to a boil, lower the heat, cover, and simmer for 3 hours. Remove the cheese rind and whole garlic cloves. Stir in balsamic vinegar, sugar, and black truffle oil. Season with more salt and pepper to taste. In your mixer bowl, add in the "00" flour and create a well in the middle with your hand. Crack eggs into the well, along with salt and extra virgin olive oil. Attach the paddle to your mixer and set it to the lowest speed. Mix until the ingredients incorporate and the dough comes together into small, sticky clumps. Form the dough into a ball and tightly wrap in plastic wrap. Place in the refrigerator to chill for 15 minutes. Remove the dough from the refrigerator and cut it into three even pieces. Replace the mixer paddle with the pasta roller. Set the mixer to the lowest speed. Run each piece of dough through the pasta roller. Start with setting #1 -- the widest setting -- and continue the process through setting #8 -- the thinnest setting -- until you've rolled out all the dough into pasta sheets for lasagna. Defrost frozen spinach, and squeeze all of the excess water from the spinach with your hands. In a bowl, mix together the ricotta, spinach, parmesan, egg, nutmeg, and black pepper, and set it aside. In a pan over medium heat, melt the butter, and then whisk in the flour. Continue whisking for one minute. Add in a few drops of milk, and whisk. Continue adding in milk, a little at a time, whisking all the while. If any lumps form, just keep whisking. Bring the sauce to a boil, and continue whisking. Boil for 2-3 minutes. Stir in the mozzarella cheese. In a lasagna baking dish, smooth a small spoonful of bolognese sauce over the bottom of the pan. Add one layer of pasta sheets. Add a thin layer of the ricotta spinach mixture. Add a sprinkling of mozzarella cheese. Cover the cheese with bolognese sauce. Repeat this pattern until the pan almost full to the top, ending with the bolognese sauce. Gently pour the béchamel sauce over the top of the lasagna and sprinkle on a bit more mozzarella. Bake for about 40 minutes, until the top of the lasagna is bubbling and is golden-brown. 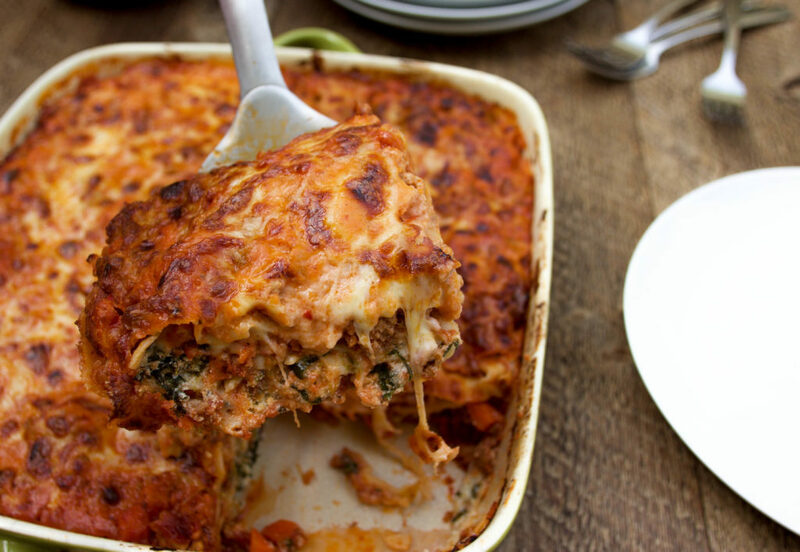 Make sure you have a deep lasagna dish, such as this one. This will ensure you can add enough layers to your lasagna. You will need a Stand Mixer and Pasta Roller and Cutter Set. You will also need a special kind of flour: “00” flour. I recommend using this Chianti Classico wine. These whole-peeled and puréed San Marzano tomatoes, are the best and totally worth splurging on. If you don't have any yet, then I recommend this black truffle oil. 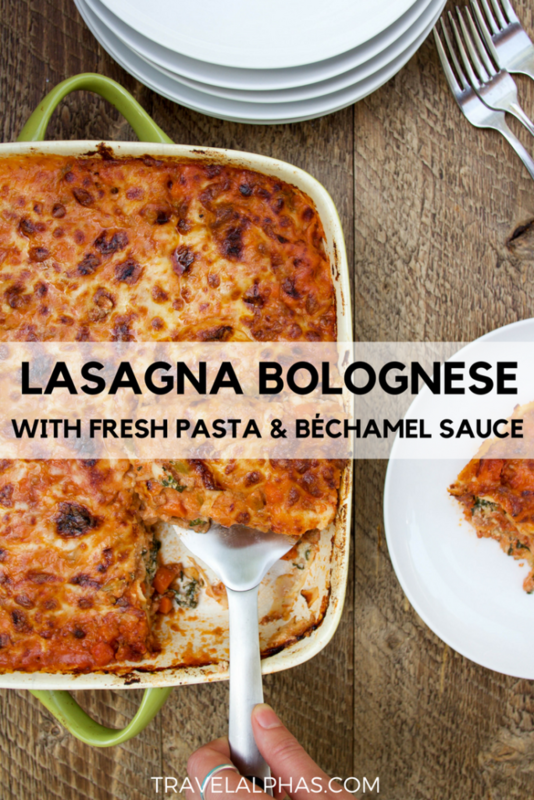 Did you make our lasagna bolognese recipe? Let us know how it went in the comments section below and tag @travelalphas and #travelalphas in your photos on social media! If you have any other questions, leave them below. You do not cook the pasta sheets before layering. I made this recipe yesterday and it is quite delicious. Next time I may not go so thin on the pasta because sometimes it tore a couple times when I was layering the lasagna. Will definitely will make again. I also have extra sauce for some homemade pasta another night. Yay! We are so happy to hear that you enjoyed it.